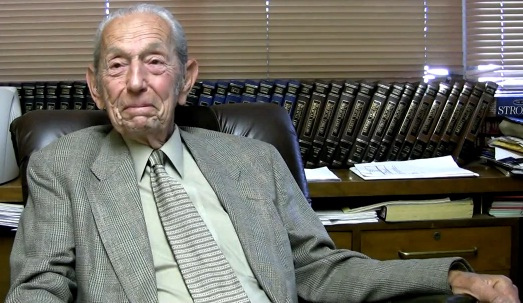 Update: Harold Camping says he will appear tonight on Family Radio’s “Open Forum” to explain himself, typically scheduled weeknights at 8:30 PM eastern time. This will prove interesting… perhaps he’ll set a new date? Perhaps he’ll actually admit he was wrong? We’ll see. Update 2: Camping has spoken! Now he says he was actually right all along about the date, but the rapture was “spiritual” in nature, not a literal one. Also: October 21 is still the actual end of the world, and the earthquakes and destruction WILL happen then! Whoops, silly mistake right? Full coverage on Huffington Posts’ Live Blog of the event. Proverbs 26:11 – As a dog returns to its vomit, so a fool repeats his folly. 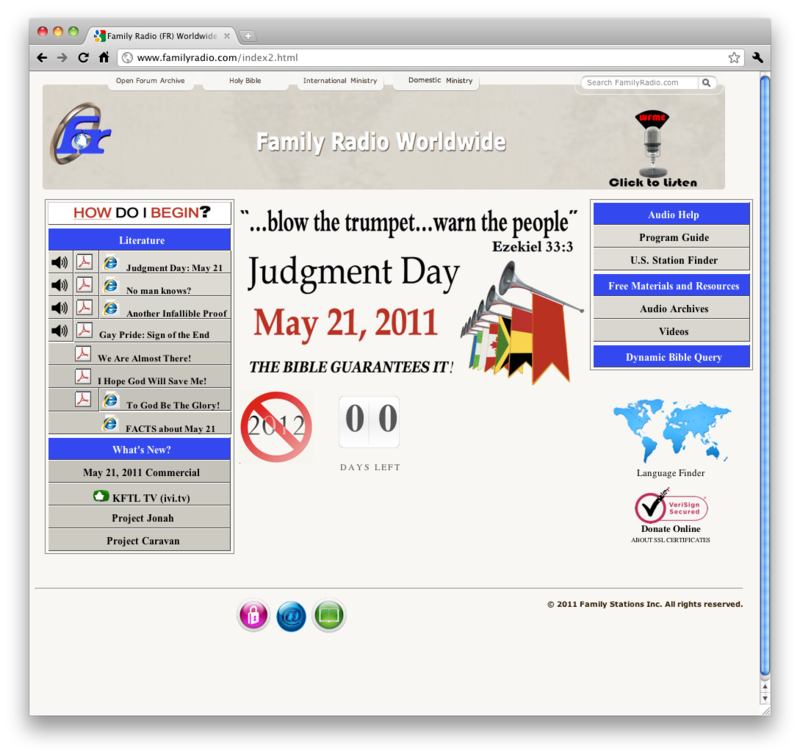 If you happened to believe Family Radio founder Harold Camping, yesterday was supposed to be the Beginning of the End. However, it would appear, at least to most mortals anyway, that nothing of note actually happened. According to Camping relatives, who spoke to him late on May 21, he was “a little bewildered,” but still holding on to the prediction as the day hadn’t flipped to May 22 yet around the world. And so, it looks like the stage has been set up for anther Great Disappointment. Some of his believers, having seen nothing happen, have returned from their campaigns to get the message out, already disappointed and crestfallen, to find the Family Radio headquarters locked up tight and with no one home. It’s hard to estimate how many people followed Camping’s predictions, but they are likely coming to the realization that their false prophet was wrong. Again. Some of them have believed in it so much that their post-”apocalypse” lives are going to be very difficult. Life savings have been spent. (Update: the guy who spent his life savings responds to the non-event here.) Credit cards maxed out. Believing parents have squandered the college funds of their more level-headed children. No doubt, lives have been drastically altered, possibly even ruined because so many people chose to beleive the teachings of a single man who claimed to know it all. There are varying opinions and observations on Harold Camping. Some report on the kindly old man with no pretense and a deep conviction. Others who “grew up” with him report on his self-teaching and constant misinterpretations of religious text, his megalomania, his ego, his indignation from being kicked out of the church and the possible goal of trying to destroy churches all over with his teachings in an attempt at vengeance. There’s also the monetary aspect. 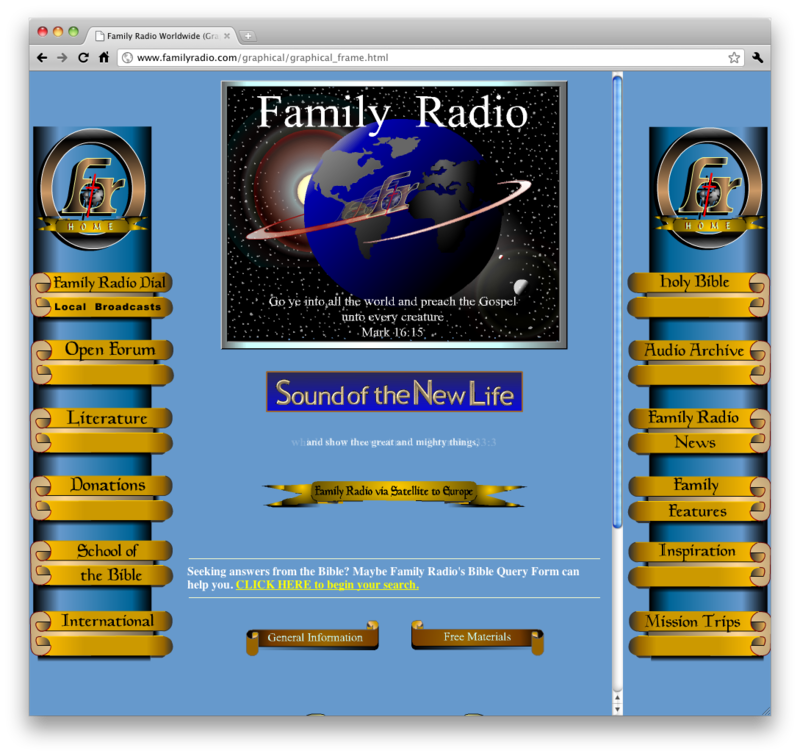 Despite the conviction that the end of the world is going to hell in a handbasket and that none of our lives, property or money will matter, Family Radio is still raking in the cash and making tax and finance-related moves as if the world is going to continue right on past the End Times. And then, there is Camping’s staff. Here’s the question that really bugs me: how can you work for a doomsday soothsayer you don’t believe? Apparently, quite a few members of Family Radio’s staff don’t believe in the May 21 prediction. Yet, as mentioned in this and many other articles, these people, despite openly non-beleiving, still showed up to work… still manned the cameras and microphones, still collected a paycheck, and still enabled Camping to spread his doomsday prophecy to the very end. “I don’t believe in any of this stuff that’s going on, and I plan on being here next week,” a receptionist at their Oakland headquarters told CNNMoney. How do people like this sleep at night? This prediction of Camping’s has been shrugged at, dismissed and scoffed by many, but still others are waking up to a rude realization today: they “ended” their lives on Friday, quit their jobs, ruined their finances and burned bridges with “nonbeliever” friends and relatives. And here are these skeptical employees and “followers” who did more than just stand by and watch… they actively enabled it to happen! Quite frankly, I don’t envy Matt Tuter’s life, now that he likely has to answer for contributing to this massive lie. But what will become of the Big Liar himself? What will Camping say after having proclaimed over and over, with no apologies, that “this IS going to happen,” and “The Bible guarantees it?” He could come back on the air Monday, and come up with some excuse… a miscalculation in his math and a new date, perhaps, or maybe he’ll say God showed his mercy upon all of us at the last minute. He could do the honorable thing and admit he was wrong and apologize. Or, he could slink away and disappear forever. A few days ago, he did send out a farewell letter to his staff advising them to carry on their good work as he departed. And immediately, bloggers and news sources all over began to dissect it for hidden meaning. Could it mean that he won’t come back even if the Rapture didn’t come? Could it be a suicide note? Only Camping himself knows for sure. In fact, only Camping knows a lot of things. Like, did he truly believe his own prediction? Did he mean well, or was there a motive behind what he did? And simplest of all… why? These are questions that we may get answered in time. Or, we may never know them at all. 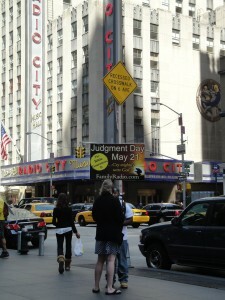 Harold Camping is getting close to 90 years old. Not quite as limber as when he predicted the end in 1994... and all those other times that he doesn’t talk about. He might not have the strength or the will to get back on his feet and carry on. Perhaps he hoped the end would really come… if not by Rapture, then by his own days on earth coming to an end before the Big Day. At least in such a case, he wouldn’t been around to have to face his followers. It’s true that some people just can’t take their eyes off a good trainwreck. And so, I would speculate that this has probably been the most well-covered, well-publicized and well-known doomsday prediction ever made. 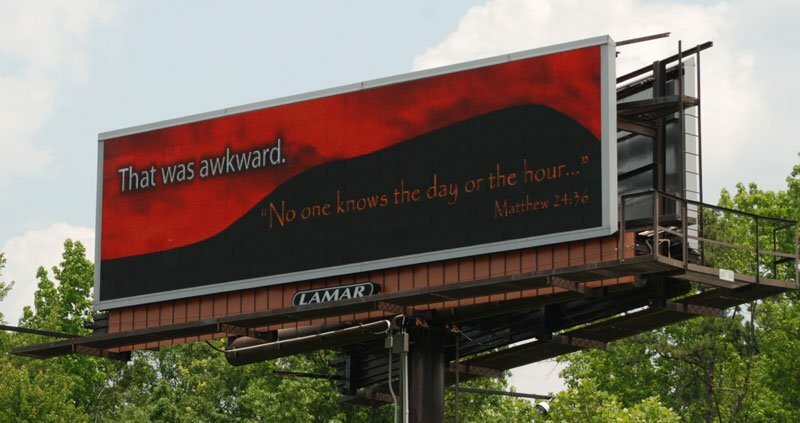 The internet, social networking, and even Campings own efforts through his billboards, radio stations, television stations, and by his sending out caravans of believers to get people all riled up, have made certain of this. And so, the effects will likely be more profound than any other failed doomsday prediction… both for his followers, and possibly for Camping and his modest media empire. No doubt, in the Post Rapture parties and other gatherings of atheists and skeptics circles, this non-event will be another feather in their caps… another reason to point to in arguments for why religion is just a big myth. The religious camps will likely posture, point to Family Radio as being controlled by a cult leader, and that this is the time to come back to the church and engage in real worship, where “no man knows the day nor the hour” of Christ’s return. The disillusioned among Camping’s camp (pun intended) will have to figure out what to do next with their lives. Some may go to the churches Camping railed against… or they may turn away from faith altogether and become skeptics, atheists and agnostics… some, I fear, may be faced with such grief that they may bring about an end to their lives all by themselves. Again, only time will tell. Truly, the Lord – or whatever you believe in – works in mysterious ways.